Military War Dog handler Liza Minot finally lands her big chance. A Delta Force mission requires her and Sergey’s specialty—tracking explosives. When assigned to Master Sergeant Garret Conway’s squad, her past confronts her. Back in high school days, he ran over her first dog. Rex’s old age and failing health made it a cruelty or a mercy—she still can’t decide which. However, Conway the boy and Conway the man are two very different problems. 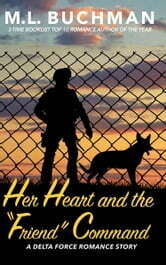 Only with her war dog’s help can they both break free of their past to track down Her Heart and the “Friend” Command.